Neurotic ambition unites the disparate sounds of the city. You can hear it in the libertine poetry of Patti Smith, the dissonant guitars of Sonic Youth, and the outraged prophecies of Public Enemy. What you also hear, and what may be most New York, is the obsessive need to create new sounds. This is not to say you can’t make something original out of used parts (the Strokes for one did it so very well). Points are given for style (hello, Run D.M.C. ), but not if it overshadows the music (good-bye, sadly, New York Dolls). Also left off is Bruce Springsteen, a onetime fixture at the Bottom Line who has written many great songs about New York but who otherwise personifies you-know-where. The Feelies, out of Hoboken, make the cut because of their close identification with the downtown scene. And because nobody ever sounded more neurotic. “Jesus died for somebody’s sins, but not mine.” Smith was the great poet of the Bowery, and her debut album, with the gorgeous cover photograph by her friend Robert Mapplethorpe, is a courageous and unnerving act of self-exposure, the pinnacle of rock as art. The Ramones were classic outsiders, four guys from Forest Hills who barged their way into the center of the world. Lasting longer than most of their CBGB peers combined, they made a handful of classic albums, though none ever quite equaled their debut, on which the band’s fearless amateurism feels purest. Though they hardly looked it, this was the Bowery’s highbrow act. The album is a master class in art-rock jamming, taught by Tom Verlaine, whose solos were freaky non sequiturs, and Richard Lloyd, a more fluid, pragmatic player, though no less astonishing. Even amid the crappiness of seventies New York, glam could not be snuffed out, and nobody was more glam than Deborah Harry. Blondie gets lumped in with punk and new wave, but on this record they outed themselves as a pop band, a brilliant one, and if not for all the drugs and dissension, they would have conquered the world. The classic New York Latin sound of the seventies hit its peak here, with passionately sung stories of hardscrabble Latin street life set to a scorching salsa beat and four wailing trombones. On the megahit “Pedro Navaja,” you can actually hear street noise. Legendary Brian Eno–produced compilation gathered James Chance, Lydia Lunch, Arto Lindsay, and DNA into a document of the “no wave” scene that sounds tighter, more angular, and more brutal than almost any other punk. Old Paradise Garage veterans say Larry Levan was a religious experience on two turntables, but none of his posthumously released D.J. sets really prove it. This ten-minute, exquisitely orchestrated bass fantasia backs up every legend. What if someone made the sound of New York’s neighborhoods into world music? David Byrne and Brian Eno make connections between African funk, hip-hop, Jamaican dub, and future electronics that would inspire for a decade or more. They were killer nerds, equal parts passive (buried, Velvets-y vocals) and aggressive (manic guitars), an approach that sonically and conceptually laid the groundwork for the white-boy college-rock revolution that followed them. It’s easy to forget how playful and goofy the early years of hip-hop were. Take a ringside seat on the block to hear the Cold Crush Brothers, Grand Wizard Theodore, Double Trouble, and other early-eighties legends battle. Full of the energy of her early years scuffling around New York dance clubs, this is the album where she invents modern dance-pop while staying cool enough to inspire a Sonic Youth cover. The invention of indie hip-hop, ten years before the fact. With a cover and contributions from Jean-Michel Basquiat, this ten-minute twelve-inch treated hip-hop as abstract art, dropping surreal battle rhymes over psychedelic beats. The pivotal record that took rap out of the neighborhoods where it was born and spread it into popular culture. 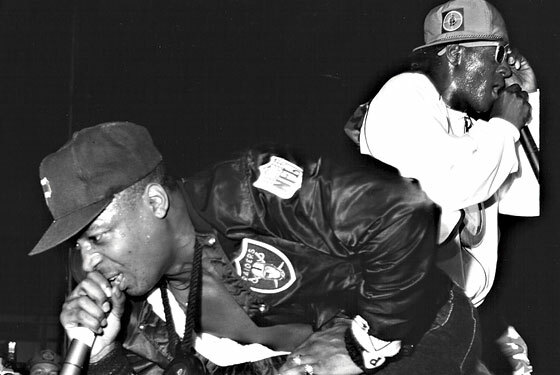 Rejecting the flamboyancy of the early rap legends, Run D.M.C. pioneered the street-tough aesthetic that became hip-hop’s signature style. Russell was the human embodiment of the mixed-up culture of late-seventies New York, releasing soundtracks for Studio 54 and avant-garde theater productions alike. World of Echo, a set of introverted songscapes scored to cello and dubbed-out electronics, sounds like disco turned inside out. Harnessing the arty dissonance of their early work, Sonic Youth made an album with just enough rock convention to lift themselves out of the New York underground and into the realm of alternative rock. In which they proved that they were real New Yorkers, not frat boys. From the cover photo shot at the corner of Ludlow and Rivington to the 4 a.m. subway ride to Coney Island in “Stop That Train,” their greatest album is also their most local. The hip-hop album as movie thriller, with Chuck D playing revolutionary hero, Flavor Flav as reality-TV star in waiting, and countless sonic plot twists. “Fight the Power” still irresistibly evokes the hot summer of ’89. While PE promised a black revolution, Wu-Tang created their own nihilistic code. Of the half-dozen classic albums that group members created over the years, their debut catches the crew at their most exotic: Staten Island enigmas spouting a combination of kung fu mysticism and Five Percenter doctrine. Grimy reworks of Memphis soul provide the sonic backdrop for the group’s bleak parables of Samurai-inspired ghetto honor. Illmatic is rife with closely observed street narratives: “N.Y. State of Mind” is told from the perspective of a child drug dealer. But what distinguishes the album most of all is its jazziness, a product of New York’s cultural melting pot. They’re making a biopic about Biggie, but there’s no way any movie could tell the life story of the conscience-plagued Bed-Stuy criminal turned superstar turned martyr any more entertainingly or movingly. Stephin Merritt began his ascent to Lincoln Center headliner with this opus. Every tune finds him experimenting with a different style, and though he fails as often as he succeeds, his obsessiveness marks this as a distinctly New York masterpiece. Though some dismissed Moby’s integration of antique blues and gospel snippets into modern, electronic songs as mere novelty—and others castigated him for licensing every last bar of them for commercials and movies—Play was a legitimately innovative work that also happened to prefigure the emerging values of the new downtown: the obsession with “nobody else has it” vintage and the seamless fusion of culture and money. In an era addicted to rock revivalism, the Strokes were its most skilled and disciplined practitioners, riling purists and thrilling the kids with a pitch-perfect distillation of mid-to-late-seventies New York rock. Purists might pick Reasonable Doubt, but his late-period commercial peak is more adventurous. Trademark New York braggadocio has never sounded quite so self-assured. Rejecting guitar-centric noise, ex–rock dude James Murphy made it fun to dance in New York again, with sophisticated beats that effortlessly cruise across the musical landscape, while still delivering essential shake-your-booty appeal.